The shift to the 3-4 brings new opportunities as well as new challenges for the front seven at Nebraska. Some of the players on the roster seem like perfect fits already, while others are going to have to make a big adjustment. Brandon Vogel has already broken down what the linebacker situation looks like, so that leaves us with the defensive line here. Mike Riley was kind enough to offer up a preliminary depth chart at Tuesday’s spring-opening press conference, answering some of the biggest questions about where players will line up. Let’s dive into what the competition will look like in the spring. The 3-4 starts in the middle. To run this kind of defense a team needs a monster at the point of attack to hold the line and let the edge rushers get into the backfield. According to Riley, Stoltenberg will get the first crack at holding down that position after recording 25 tackles including three for loss as a sophomore. 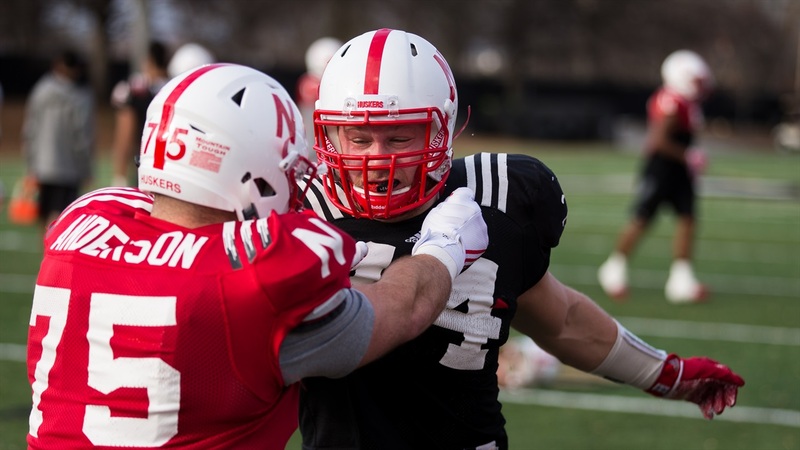 At 6-foot-5, he doesn’t have the prototypical build for a nose where leverage is important, but the coaches have faith in him at that position and Stoltenberg said he is excited about his opportunity. To help him hold his own at the nose, Stoltenberg said he has added 15 to 20 pounds already since the end of last season and is weighing in around 310 pounds. Behind Stoltenberg is sophomore Khalil Davis, who is listed at 6-foot-2 and 290 pounds. Freshman Damion Daniels will add depth at 6-foot-2 and 310 pounds once he arrives in campus. Walk-ons Fyn Anderson (6-foot-3, 275 pounds) and Joel Lopez (6-foot-2, 285 pounds) will also practice at the nose. In the 3-4, the defensive ends are closer to 4-3 defensive tackles than ends in measurable and responsibilities. On the short – or boundary – side of the field, sophomore Carlos Davis is in line to start after showing some serious flashes last season. Davis totaled 24 tackles, five tackles for loss, two sacks and three quarterback hurries as a redshirt freshman. Peyton Newell (6-foot-3, 290 pounds) and walk-ons Dylan Owen (6-foot-5, 260 pounds) and Erik Evans (6-foot-3, 255 pounds) are set to play behind Davis heading into the spring. The field side defensive end is the more interesting one as junior Freedom Akinmoladun is set to start at 6-foot-4 and 270 pounds. Some speculated that dropping weight and moving back to outside linebacker would be the best move for Akinmoladun, but Riley and Diaco are keeping him on the line. As a sophomore, Akinmoladun recorded 32 tackles and tied for second on the team with four sacks. Behind Akinmoladun is redshirt sophomore DaiShoan Neal. At 6-foot-7 and 270 pounds, Neal gives a team more length at the defensive end spot which could come in handy on the field side. At 6-foot-5 and 260 pounds, A.J. Natter is the other player Riley mentioned at the field side defensive end. We will have to wait until the fall to see where freshmen Deiontae Watts and Deontre Thomas line up. Diaco and Parrella have a range of different body types to try out on the defensive line as we head into spring football, but once they hit the field on Saturday it is up to the players to prove they can hold their own at their new position. The edge rushers rack up the stats in a 3-4, but the defensive line is the true key to making it work. Nebraska is going to rely on its War Daddies more than ever before. For a closer look at other position groups, check out our spring football preview on the quarterbacks, linebackers, running backs, wide receivers, offensive line, secondary and specialists.